Blog – Page 3 – Clare Walks Ltd. Some of the fantastic pieces made through our Humble Jumble upcycling project are now on our window display at our office on Main Street, Tulla. Why not come along and take a peek…. On possibly the driest day we have had so far in 2018, 27 eager walkers showed up in Quin last Thursday to take part in the first guided walk of the year for Active Agers (Over 50’s). We departed from Quin Hall passing by the 14th century Quin Abbey; the ruins of St. Fineen’s Church and headed towards Ballyhickey, where we passed the remains of the Lead and Silver Mine. Metal was discovered here in 1834 and by 1838, 2,500 tons of ore had been shipped via Clarecastle to Wales for smelting. From here we continued past Clooney-Quin GAA club and bacl to Quin village, walking just under 7kms. A most enjoyable walk and it was a great novelty to be out walking in dry weather. The next walk will take place on Thursday 22nd February on part of the East Clare Way (exact route to be confirmed). Hope to see you then. Come along and join in our guided walk along part of the Mid Clare Way walking route. We will leave Quin Community Hall, Quin at 11am on Thursday 25th January 2018 (weather permitting) for a 7km walk passing Quin Abbey, St. Fineens Church and Ballyhickey Lead Mine. This walk is mostly on quiet roadways with no hills. There is an optional coffee stop in Quin when we return. The walk is primarily for Over 50’s but everyone is welcome. The walk is free/donations are optional. All monies rasied will go towards the future maintenance and upkeep of the East Clare Way & the Mid Clare Way walking routes. Please bring suitable footwear, raingear and water. Dogs are welcome but must be kept on a lead at all times. Clare Walks Ltd is a not for profit organisation managed by a voluntary board of directors. The organisation oversees the maintenance and general upkeep of the East Clare Way and the Mid Clare Way walking routes, to ensure that they remain an accessible amenity to the general public and tourists alike. Take a look and if there is anything you would like to buy, please contact us on 065 6835912 or e-mail: info@clarewalks.ie. Keep an eye on this website or on our Facebook page as more unique creations will be added regularly. Enjoy…. A huge thanks to the 30 enthuiastic walkers who joined in this mornings guided walk from Quin village to Mooghaun Hillfort and back to Quin. Thanks to Lola’s Iphone app we now know that we walked 10.6kms (18,366 steps); so I think we were fully entitled to go to The Tea Rooms in Quin for some tea & coffee amazing scones/cakes, and a good ole chat. Even though some parts were quite muddy, I think everyone enjoyed the day. See you all on November 30th (weather permitting) for the next walk. We were so lucky with the nice weather today for our Guided Mindfulness Photo Walk in Dromore Woods, Ruan to celebrate the season of creation. A huge thanks to Tatjana Simakova for joining in the walk & giving us an introduction to Mindfulness & how to practice mindfulness in our everyday lives. Thanks to everyone who helped with the organising. As part of Heritage Week 2017, Clare Walks Ltd. organised a FREE guided 6km walk in the stunning Dromore Wood Nature Reserve in Ruan. The walk was for anyone over 50 years of age who was interested in getting active and staying healthy and was organised in conjunction with Go For Life. We had a great turn out for this guided walk with a fab group of 24 ladies (& 2 brave gentlemen). 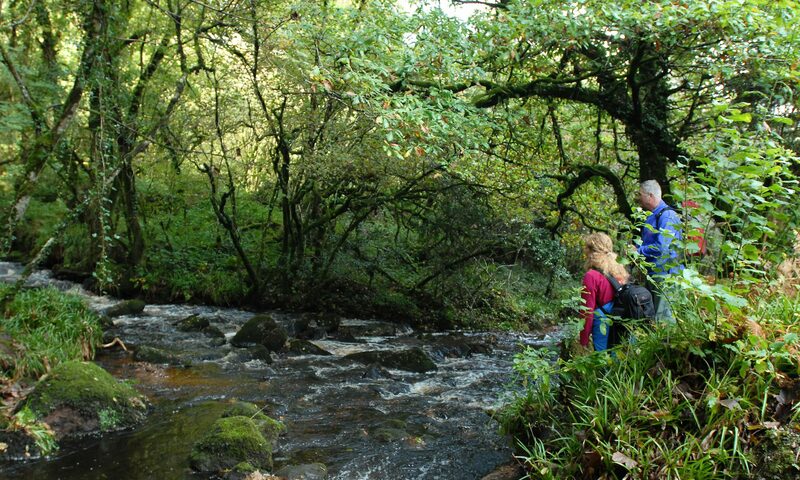 We had a most enjoyable walk along woodland paths, passing river and lakes and a woodland full of a variety of species and interesting historical and archaeological sites. AND of course there was plenty of chat! Looking forward to our next outing in September. Lovely walk. Don’t let the idea of some minor roads walking put you off as the views across the lake make it all worthwhile. Lovely variety of woodland, trails, forest, and open road walking. Especially loved the green path walk down towards Flagmount. The village is a perfect spot for an ice-cream break before the final 3km. What a great review of the Cahermurphy Loop on the East Clare Way – thanks Elsie. With weather like this, who wouldn’t want to hit the trails! Dromore Woods: Well Worth a Visit! In conjunction with Age & Opportunity Ireland, Clare Walks Ltd. organised a free guided walk for anyone over the age of 50 who is interested in getting active and staying healthy. I have to say it was such a lovely morning – the weather, the setting, the walks and of course the company. Dromore Woods is definitely a place everyone should visit and it is suitable for all ages. The views, the woodland trails and the tranquility are all amazing – in the middle of the forest you can sit and hear a chorus of birds singing their hearts out. And it is so well signposted that you cannot get lost. Unfortunately some of the trails were flooded but it didn’t “dampen” our spirits and we all agreed that we will take another trip there in the coming months to do some more exploring. Our next walk for Active Agers will take place on Thursday 30th March @ 10am from Quin to Mooghaun Hillfort – another amazing setting – with a stop in the woods for a snack and a chat, before returning to Quin. Make sure you come along.